Inline Search Results in Mobile Google Search? Google's goal used to be sending users as quickly as possible to the best sites that answered their questions. Smartphone's popularity changed this and Google started to show detailed answers that used information from other sites. On-the-go users don't have much time to check multiple search results and find their answers, many sites aren't optimized for mobile, mobile data is still expensive and users have to deal with slow Internet connections. Brandon Giesing noticed an interesting question from Google Opinion Rewards: "Imagine you're Googling on your phone. 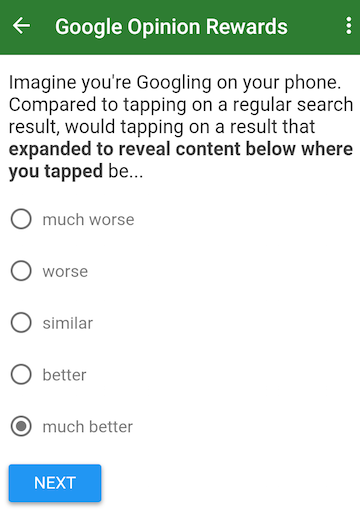 Compared to tapping on a regular search result, would tapping on a result that expanded to reveal content below where you tapped would be... much worse/worse/similar/better/much better?" It looks like Google considers adding a feature that loads the content of a search result inline, probably from Google Cache. This would be really cool! I would like to see this! This would mean Google is using my websites content to keep the user on the Google SERP page and I get Absolutely Nothing in return for it. Bad idea!! Not the latest content. Need to go to the actual page. I am 100% for this. Saves me from having to load yet another ad riddled mobile page and then have to swim through 5 ads just to get to the actual page and read the article that may or may not answer my questions. This would be magnificent.